Whilst edible container gardening has many advantages, some people find they have to water more frequently. This is often due to the soil mix used. The core ingredient in most commercial potting mixes is cheap pine bark. Unfortunately, it tends to dry out quickly. This causes container gardens to become hydrophobic (repel water). So are there easy solutions? Thankfully, in my experience, YES! My drought resistant herbs like thyme, rosemary, oregano, aloe vera, five spice herb & chives thrive in this repurposed basket planter. 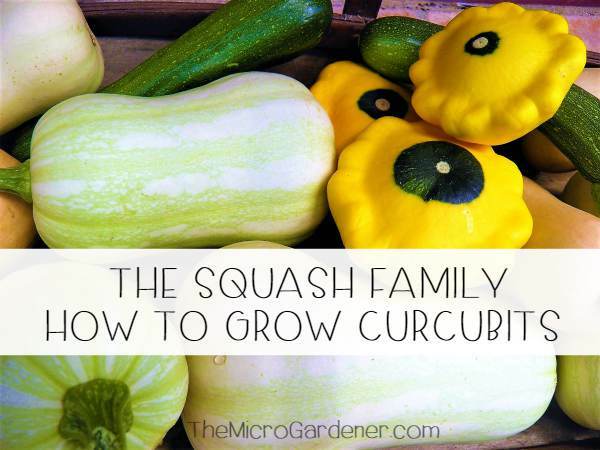 They only need occasional watering and cope well even in a compact space. 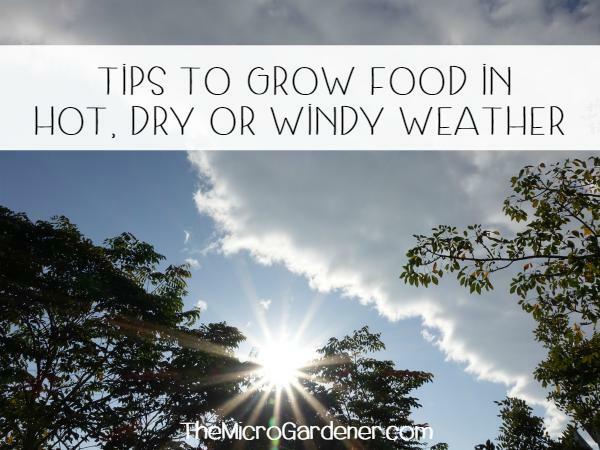 These are some of the key strategies I use to grow healthy crops in pots – even in tough, dry conditions. 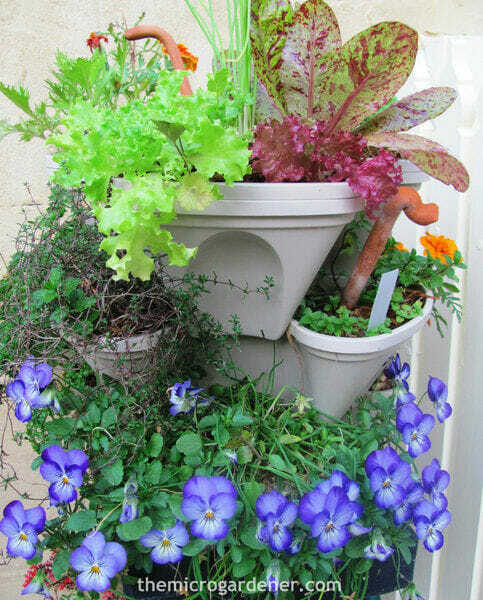 Choose pots wisely to minimize moisture loss. Avoid porous planters like terracotta or coconut/coir fibre liners in hanging baskets. These materials leach nutrients and moisture more rapidly than glazed ceramic pots and solid stone. Dark colours like black, and metal containers heat up quickly. They provide little insulation, causing the potting soil to dry out faster and increase the possibility of root damage. If you have dark coloured pots, try positioning in a shady spot with shade-loving edibles. Locate your light coloured, non-porous pots in full sun areas. 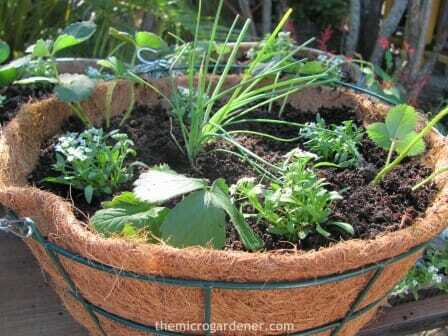 If you already have coconut fibre basket liners, include moisture-hugging ingredients in your potting mix. Add 2-3cm (1″) of mulch to the top. Edibles quickly become water-stressed when soil is left exposed like this. Use self-watering containers that slowly ‘wick’ moisture up from the bottom. You can also install drip irrigation or upturned bottles (with holes in the lid). These systems trickle water into your planter, so there’s no waste or over-watering. Water spikes are another option. They direct moisture into the root zone where your plants need it most. Self-watering pots are ideal for VIP plants as an ‘insurance policy.’ The plants draw up moisture only when they need it. Use pot saucers. Many planters come with matching saucers. Better still, make your own. Rather than wasting valuable moisture, water not absorbed immediately can ‘wick’ back up into the pot. No water lost running out the bottom! Add a thin layer of gravel or coir peat to the saucer. This helps prevent mosquitoes breeding. Improve or make your own potting mix. Add moisture-holding ingredients like coir peat (rehydrated coconut fibre). It’s hydrophilic or ‘water-loving’ (from the Greek words for water, hydro, and love, philos). Vermiculite also holds moisture, minerals and is an efficient insulator. These ingredients may help extend the time between watering. Coir peat quickly reabsorbs water, even when it has completely dried out. It holds up to 70% of its own weight in water. Build healthy living soil. Plants living in a microbially-active, nutrient-rich soil are stronger, having all their mineral needs met. There are easy ways you can help create a healthy soil to support them in dry times. 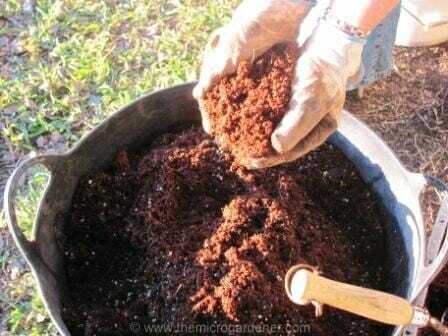 Add organic matter like compost, microbes, worm castings and minerals. Double mulch. Add a feeding mulch e.g. sugar cane. This builds organic matter, holds moisture and provides nutrients. Top this layer with a second mulch e.g. pale coloured pebbles or gravel, to help reflect heat and further improve moisture-holding capacity. 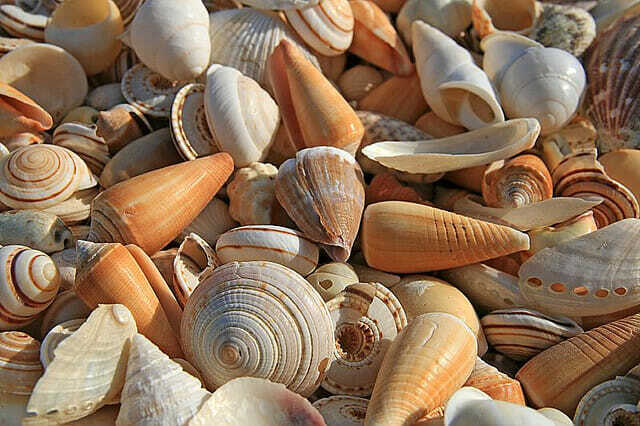 A layer of crushed or larger shells reflects heat and traps moisture. It’s also very decorative for potted edibles! Select short-season crops. They mature faster and require less water and energy to grow. The ‘Days to Maturity’ on a seed packet or catalogue will help you choose wisely. Try rocket/arugula, loose leaf lettuce varieties, radish, baby spinach, Asian greens, pea shoots, spring onions and bush beans. Choose easy-to-maintain, low-water needs edibles like sprouts, microgreens, rosemary, garlic chives, garlic, nasturtiums, chard, Malabar or New Zealand spinach, bush beans, pineapples, Italian flat leaf parsley, sage, oregano, marjoram and thyme. Look for the terms “drought tolerant” or “drought resistant” food crops on seed packets and in catalogues. Let’s face it: the mint family are thirsty water hogs! It may be more sustainable and economical to buy dried mint than grow it in dry conditions. 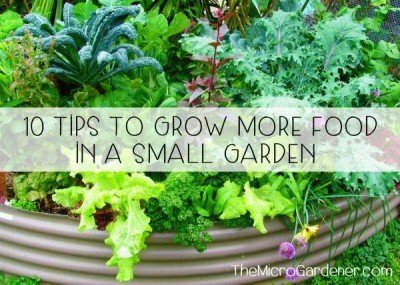 Upsize your plants into BIGGER container gardens. It’s much more efficient to water five large pots every 2-3 days than 15 small ones daily. Also try to combine plants with similar water needs. e.g. tough herbs like rosemary, thyme and oregano may only need a brief water weekly. If you combine these with edibles that need a more regular drink, you’re wasting time and water! Clay pots are OK with hardy herbs that need little watering but ensure they are well mulched. Locate tall pots and leafy plants so they shade shorter, smaller ones. Hang or attach pots vertically (one above the other) so water drips down to those below to minimise wastage. Vertical stackable planters minimise moisture loss when watering from the top. Water drips slowly into the next tier down & finally into a saucer at the base. 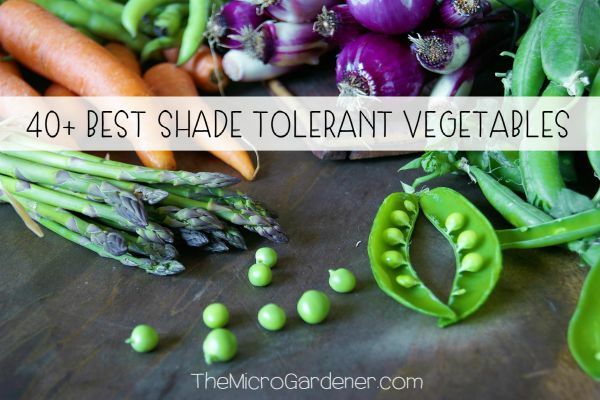 Provide short-term shade protection from the sun or drying winds to help minimise plant stress. e.g. temporary portable solutions like shade cloth stapled to stakes or A-frame trellises. Move them around to where they are needed most. Fold up when not in use. A simple DIY shade cloth system over a raised bed. Low cost, quick to assemble, portable & provides sun protection. Move plants into protected or semi-shaded conditions to minimise moisture loss. e.g. 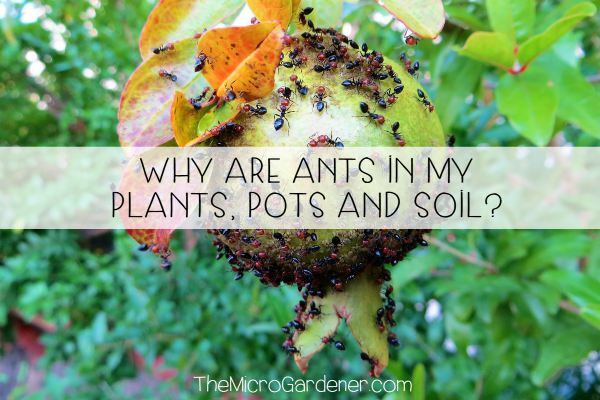 in a cooler microclimate under trees, taller plants or a porch. Prune unnecessary growth. Plants with lots of large leaves are prone to losing moisture. They transpire (lose water) through the pores or stomata on the underside of their leaves. Give plants a ‘haircut’ with secateurs at the right time of year. This may help prevent unnecessary water stress. Harvest on time. Pick produce when young and tender, before fruits and vegetables go past their prime. This helps reduce water use, minimises transpiration and conserves the plant’s energy. Use a moisture meter so you water only when absolutely necessary. Time your watering. Water when the air is still and early morning, when temperatures are cooler. Water evaporates from the soil surface more quickly later in the day, when the air is hot and dry. Watering in hot or windy weather = increased evaporation. Vegetables also tend to require more water on sunny days with low humidity. 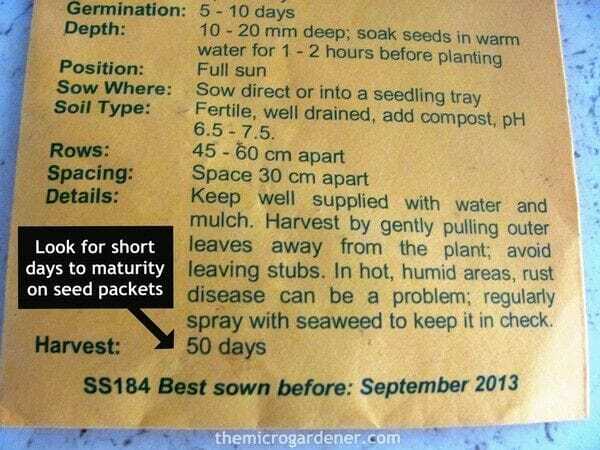 Apply seaweed/fish emulsion as a foliar spray ‘tonic’ or ‘rescue remedy’ for your plants. Water diluted liquid seaweed or fish emulsion onto foliage, fruit and flowers or use a spray bottle. This helps build resilience and healthy plant immune systems. Finally, grow only what you can manage. A small, well-maintained container garden can provide you with many of your basic food needs – even in dry conditions. Be realistic with the time, space and resources you have, so you can find satisfaction with what you choose to grow. Did you like these practical tips to help conserve water and grow healthier container gardens? Then please share this article! You might also enjoy Ten Water Saving Tips for Your Garden. Glad you found the tips helpful. Enjoy your container gardening!